Outlook Backup enables you to export Microsoft Outlook files and settings fast and simple. The program can easily export Outlook data to another PC or laptop, including emails, contacts, settings, accounts and other important data. Outlook Backup enables you to export Outlook files and settings to another computer. You may easily move all your Outlook data to another PC or laptop, export Outlook settings and accounts (with passwords) in order not to configure Outlook again on another computer. Backup all the needed Outlook data on the first computer. 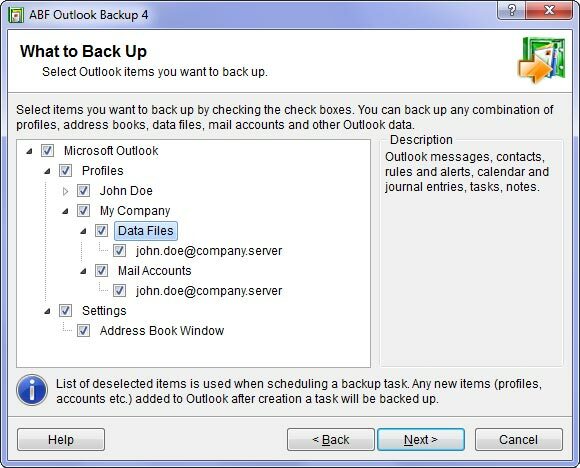 Run Outlook Backup, select Outlook items you are going to export, choose name of backup file and hit Backup button. Copy backup file to another PC or laptop. Use some media, flash drive or network to move the file to the second computer. 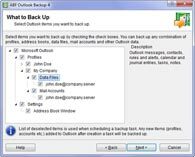 Run Outlook Backup and restore Outlook files and settings from backup file you have just moved. Note that all existing Outlook data will be overwritten. You can even export Outlook automatically and periodically using Task Builder feature of Outlook Backup - it's very useful when you need to synchronize Outlook between several computers. See also how to export Outlook contacts.